Bright, Oversized, Pastel, Etched, Bejeweled, Hardware, Floral. It doesn't matter what size it is or what's on it, one thing that does matter is that it's a clutch, which is a huge trend right now. I've had my eye on a few at different sites but the one site that always seems to have a great variety is ASOS.com. These have to be my top 6. The laser cut design on the pink clutch is so eye catching and the bejeweled clutch would be perfect for a night out. 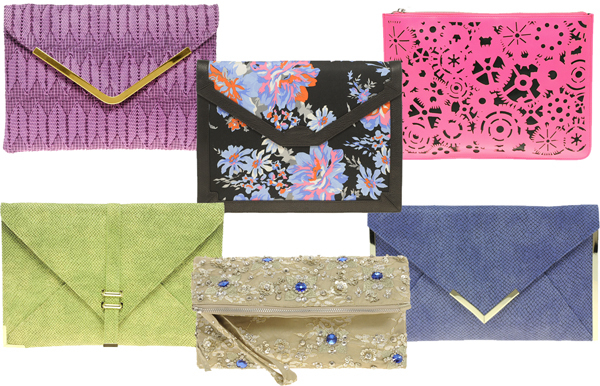 How do you feel about the clutch trend? Have a favorite? I saw some cute clutches in Target, but it seems like I always carry so many things I would never actually be able to sport a casual look just walking around with a sleek, half empty clutch in my hand. I need a bag I can carry on my shoulder.